It is always a joy to receive recipes from those who read my newspaper column or blog. When readers send me their family favorites, I am always happy to cook them for my family. Nine times out of ten, those tried-and-true recipes are a hit in our house, too. And who doesn’t love a good hoagie? I sure do, so when I received Landisville resident Maria DeAngelis Bowman’s recipe for a salad based on an Italian sub, I had high hopes. Maria explained that she and her family enjoyed a similar salad from a now-defunct stand at Lancaster Central Market. Maria set out to recreate it, and her family liked the following version better than the original. This novel salad is what Maria is now known for, and she cannot attend a potluck, barbecue, shower, or work party without a request for this dish. Cook the pasta according to package directions until al dente. Rinse with cold water, and then set aside to cool. Rinse the lettuce, dry well, and chop into bite-size pieces. Halve the tomatoes, if using, and cut the salami into small pieces. Refrigerate for at least 1 hour before serving to allow the flavors to meld. 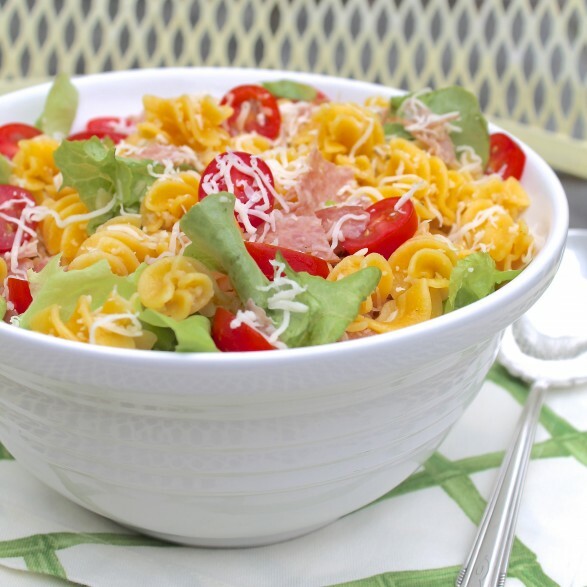 *My favorite gluten-free pasta for this recipe is a rotelle quinoa and corn blend. Two brands of gluten-free pasta that we typically purchase and enjoy are Ancient Harvest or Rienzi. **I use Good Seasons Zesty Italian and mix with olive oil and red wine vinegar as per package instructions. ***Baby spinach or baby kale are nice options if you’d like to make this salad for lunches throughout the week as they won’t wilt as readily as leaf lettuce. ****Dicing a thick slice of salami works well, although I like to have it chipped at the deli counter and then roughly chop it before mixing with the other ingredients. 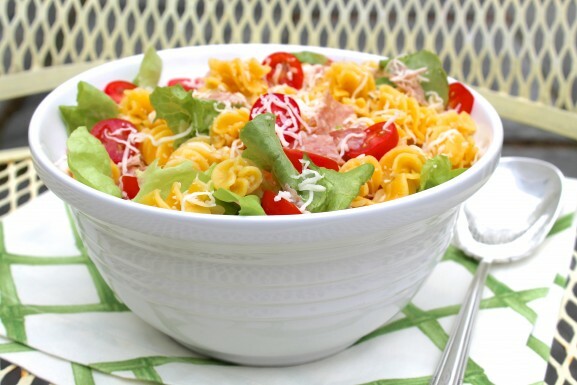 This way, a small amount of salami goes a long way in providing tremendous flavor in the salad. I made this for the third time for a soccer picnic this weekend. Among many pasta dishes – this one was completely emptied! Much to my husband’s disappointment, no leftovers – we love it! Looks perfect to put in a mason jar for my teenage sons lunch. Great lunchbox idea! Thanks for the comment, Jenne! Thank you, Heather…and you are welcome! My sister-in-law changed it up according to what she had on hand with equally delicious results. She replaced the dressing with ranch, the lettuce with cucumbers, the salami for ham, and the cheese for cheddar. I’m now lucky enough to enjoy both versions. I have had more people tell me that they love this salad, Maria, and that they make it often. Thank you again for sharing your recipe last summer and for the recent adaptations! I am going to make this simply because you are from Lancaster County and I know that you know good food! I am from Reading,Pa (berks county), not far from Lancaster and graduated from Millersville University. I have been looking for this recipe and I trust this one. Thanks! I love your comment, Terri, and I think you will adore the salad! It has become a favorite in our house and among many friends. Hope all is well in Reading! This salad sounds great but the Good Seasons dressing has changed and I believe it is no longer gluten free. Please check this before making the salad. That is great to know. Thank you for mentioning, Jo. A red wine, balsamic, or other Italian vinaigrette would be a good alternative.